From incoming inspection to a complete written estimate and professional repair at the best price around, SCE will treat your camera like it was our own. At SCE you will ALWAYS speak directly with an engineer. Repairs on most Panasonic camera models are completed in 72 hours or less. Panasonic AG-HMC40, AG-HMC45, AG-UX90PJ 4K, AG-AF100, AG-AC130, AG-HMC150, AG-AC160, AG-HPX170, AG-UX180PJ 4K, AG-DVX200 4K, AG-HVX200, AG-HPX250, AG-HPX255, AG-HPX300, AG-HPX370, AG-HPX500, AJ-PX230, AJ-PX270, AJ-PX380G AND AJ-HDX900 REPAIRS CAN BE COMPLETED IN ONE DAY OR LESS. Same day service is available on all Panasonic models for walk-in customers. Feel free to observe your camera being repaired or get an immediate written estimate in person or verbal estimate over the phone. SCE is ready when you are. Open evening and weekends until 10PM. 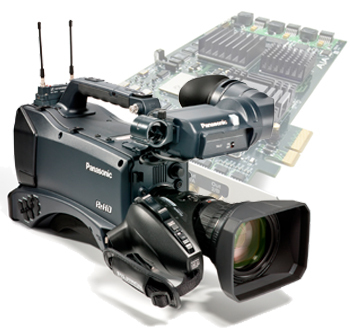 With over 3 decades of repair experience including over 17 years experience working at the Panasonic Broadcast Service Center in Los Angeles we know the all necessary updates, little details and required service procedures of your camera. We have serviced and repaired 1000’s of Panasonic cameras and we take no shortcuts with our highly professional services. SPECIALIZING IN PANASONIC CAMERA MODELS AG-HMC40, AG-HMC45, AG-UX90PJ 4K, AG-AF100, AG-AC130, AG-HMC150, AG-AC160, AG-HPX170, AG-UX180PJ 4K, AG-DVX200 4K, AG-HVX200, AG-HPX250, AG-HPX255, AG-HPX300, AG-HPX370, AG-HPX500, AJ-PX230, AJ-PX270, AJ-PX380G AND AJ-HDX900. As the factory engineer assigned to these models since they first came on the market, I have repaired over 5,000 of these units alone. I am getting pretty good at it, too!! A typical camera repair from SCE can be about half the cost of the same repair at a factory authorized service center. Don’t risk using just any repair center that may not be familiar with factory procedures for Panasonic camera repair. Please call us for a quote!! SCE offers flat fees for most common camera repairs such as camera cleaning and alignment, blown fuses, broken connectors and physical damage. Check our prices! SCE has hundreds of satisfied customers from every corner of the US and even some from overseas. While most of our customers are television stations, rental houses and cable broadcasters, we also cater to independent producers and filmmakers who need their cameras repaired fast and done right the first time. For SCE, no job is too big or too small. SCE always pays close attention to detail. All cameras are given a complete function check coming in and going out, cleaned internally with air and updated to the latest software versions. Stripped and missing hardware is replaced and we are experts in the cleanup of all sand and water damage. Full documentation is provided with all repairs. You’ll sleep easier because every SCE repair comes with our 90 day limited warranty.